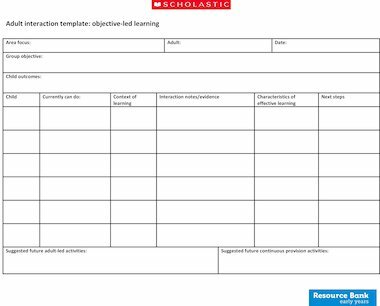 This template is designed to support the objective-led approach to learning in the EYFS. The template contains space for the focus strand of the EYFS Framework, alongside ‘group’ objectives and outcomes. A ‘group’ is a set of children working on the same objective and similar outcomes; it is not a group of children expected to be working together. Practitioners can note any interactions they engage in with individuals and how the objective and outcome has been achieved. The learning context, next steps and possible further activities can then be identified and planned for. Practitioners also have space to record any characteristics of effective learning. An annotated example of how to complete the template is provided on page two of the document.